The location is ideal. 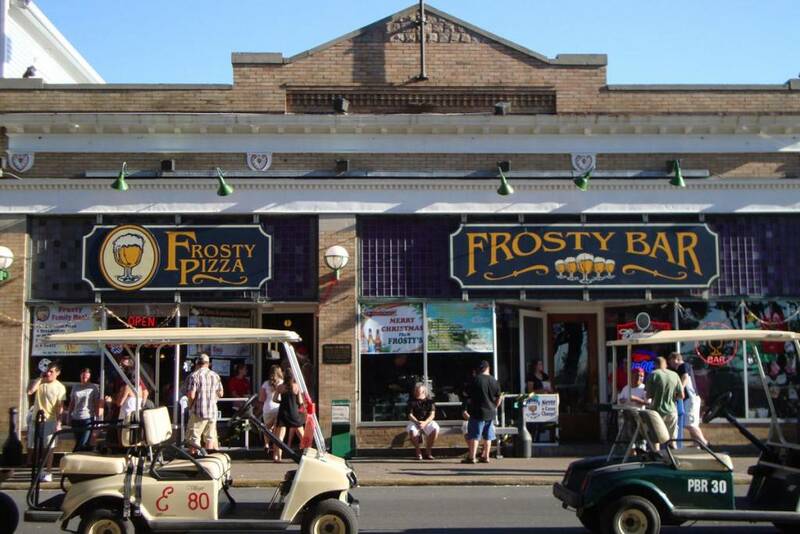 In the heart of downtown Put-in-Bay on Delaware Avenue is where one can find Frosty’s. The picturesque DeRivera Park is located across the street. Additionally, the Jet Express ferry terminal is just a short stroll away. From this location, guests can access the majority of Put-in-Bay Attractions. The menu is full of savory options. First, to start the day off right, a hearty breakfast is offered. Eggs cooked to order, breakfast sandwiches, pancakes and more highlight the menu. Also, there is a daily breakfast special. Examples include Corned Beef Hash, Philly Cheese Steak Benedict and Billy’s Banana Pancakes. The delectable options continue on for lunch and dinner. Most notably, the pizza at Frosty’s is legendary. Cheese and toppings are piled high on their thick crust. Also, there is a variety of specialty sandwiches. Options include the Italian Sub, Gyro and Buffalo Ranch Chicken. For great savings, be sure to check out the Family Meal. For one low price, guests recieve a large pizza, family salad, bread sticks and four sodas. Dine inside the bar area, outside at Frosty’s backyard or take out and enjoy in the park. Regardless, diners are sure to leave full and satisfied. Lastly, be sure to check out the entertainment. On weekends, a local DJ spins tunes into the wee hours of the night. Dance to your hearts content under the stars or inside this classic Put-in-Bay eatery. So, come hungry, leave happy and entertained!